This is perfection! Beauty and elegance in each stitch. It looks very classical in this color but this beautiful pattern is a modification of the popular Charlotte – Large Square by Dedri Uys: The modification of this pattern starts after the 36 round of Charlotte. This example is composed of double-knit yarn and 3 colors have been used, however, you can use any yarn and more colors than 3 if you wish. 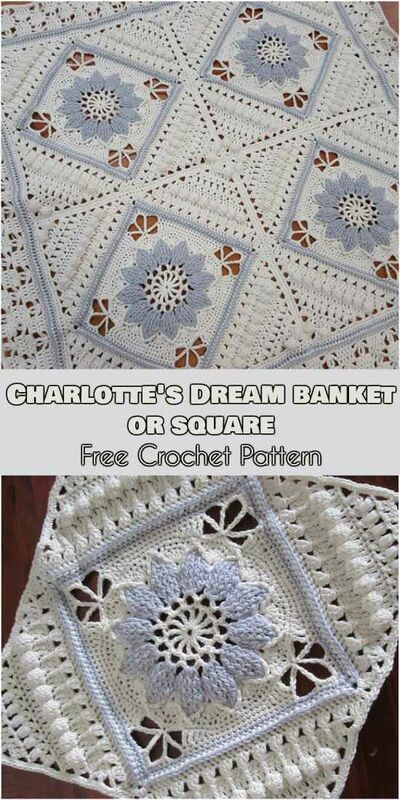 Free pattern of Charlotte – Large Square you will also find below. How to do Charlotte – Large Crochet Square is here. Charlotte’s Sunshine Baby – modification of Large Square – Free Crochet Pattern is here.